A campaign official said they had no records indicating that she had informed Harvard of Native American heritage that year. The official further said that Warren had been unable to answer questions about the issue before now because she had forgotten many of the details and had asked her campaign to thoroughly review the evidence. The campaign declined to say whether Warren provided the information to Harvard and Penn verbally or by checking a box on a form. The Harvard records do not list a Native American during the years Warren returned to her post at the University of Pennsylvania, but begin to list one in 1995-96, when she returned to Cambridge as a tenured professor. Two key people who recruited her to Harvard have said they did not know of her purported heritage or take it into account when hiring her. The school did not promote her as a Native American when she was hired, despite the fact that it was under intense pressure to diversify its faculty with more minorities. Warren had previously said only that she indicated minority status in an Association of American Law Schools directory used to make diversity-friendly hires beginning in the 1986-87 school year, the year before she was hired at Penn. She stopped listing herself in the directory in 1995, the year she became a tenured professor at Harvard. Before Warren’s time in the Ivy League - in the early 1980s - she indicated on an official University of Texas form that she was white. She also had the option to indicate Native American heritage at that point, but did not check that box. Current forms from Harvard, Penn, and Texas explicitly show federal racial definitions next to the boxes to be checked, though forms from the mid-1990s may not have spelled out those definitions, said Robert Warrior, director of American Indian Studies at the University of Illinois at Urbana-Champaign and an enrolled member of the Osage Nation. However, Fried acknowledged Wednesday to the Globe, it seemed strange that the issue of her heritage would not come up during the hiring process since she was recruited in the early 1990s, when the school was under intense pressure to diversify its faculty. Fried added that he learned of Warren’s purported heritage only later, when he visited her home during a party and asked her about a family picture. 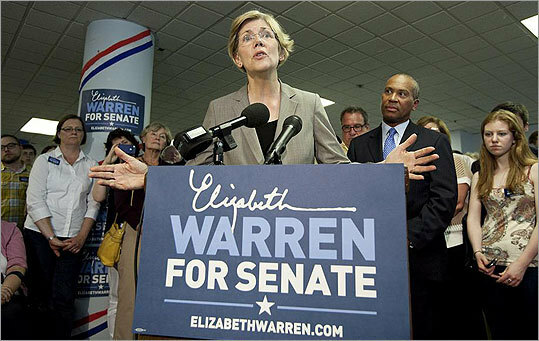 Before coming to Harvard, Warren taught at the University of Pennsylvania’s law school for seven years. For at least three of those years - 1991, 1992, and 1994 - an internal publication drawing on statistics from the university’s federal affirmative action report listed one Native American female professor in the university’s law school. Penn’s library does not have a report for the year Warren was visiting at Harvard. It is unlikely that Harvard or Penn would be censured for misreporting data to the federal labor or education departments. The education department’s penalties for inaccurate reporting focus mostly on widespread violations related to financial aid. News of the Harvard records left Ken Pepion, the administrator in charge of the university’s Native American Program from 1999 to 2003, confounded. Martin Finucane of the Globe staff contributed to this story. Mary Carmichael can be reached at mary.carmichael@globe.com. Follow her on Twitter @mary_carmichael.